The cover picture of last month’s OBM showed a motorcyclist riding to the summit of Great Dun Fell in Cumbria, where the ‘giant golf ball’ is situated. The photograph shows the Eden Valley below, with the British Gypsum Factory at Kirkby Thore clearly visible. The Motor Cycle’s staffman John Ebbrell makes his way towards the 2000ft contour over Great Dun Fell near Knock in Cumbria. riders that this road is privately owned by the CAA, and that permission needs to be sought to ride a motorcycle, or drive a car, to the top. Twenty or so years ago, the late Peter Hetherington and I made a successful ascent and descent on our LE Velocettes without trouble. Peter had grazing rights on the fell for his sheep, so we were allowed up. He lived locally, was a brilliant engineer and is sorely missed. I’m sure I remember the article in The Motor Cycle to which last month’s cover picture relates. 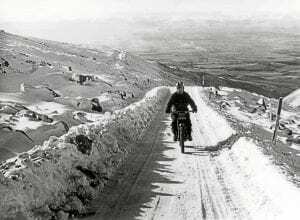 The rider was John Ebbrell, and the bike was either a BSA B40 in trials trim or a WD model, and he was indeed riding to the summit of Great Dun Fell near Knock, Cumbria, up to the radar station at the top, which remains but is now redundant. As the caption stated, this is the highest road in England, although the top section is not for public use. John had special permission to ride to the top section. I usually take a ride up this road when I’m in the area, and the view from the top is stunning. Although the top section is restricted, I’ve never had a problem getting near enough to the top to walk the last bit. Read more letters, opinion, news and views in February’s issue of OBM – out now! Previous Post:From our archive: What size boots do you take?